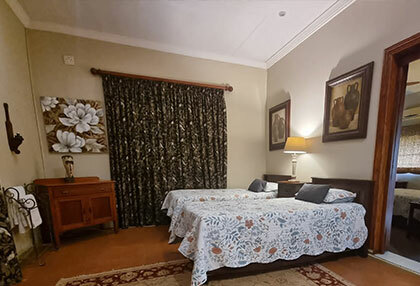 The Village Guest House is situated a mere 7km from Meyerton (in Henley on Klip), making it the perfect Meyerton accommodation establishment to choose. 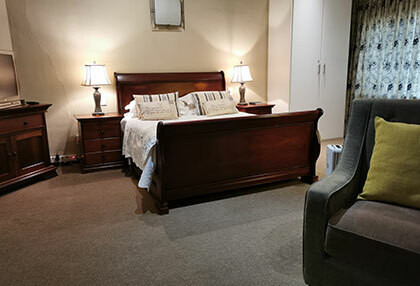 If you are in need of accommodation in or around Meyerton, The Village Guest House is the perfect solution – offering luxurious rooms equipped with all the 4 Star necessities, you will be welcomed by our friendly and professional staff, making you feel right at home. You are invited to experience our tranquil establishment for yourself, which will exceed all your expectations. 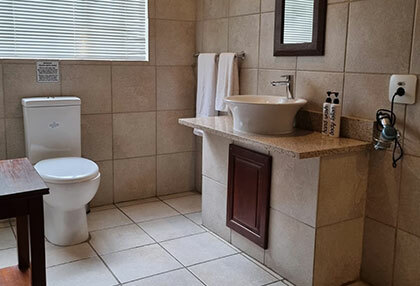 Whether you’re travelling to Meyerton for business or leisure purposes, book into our guest house in Henley on Klip, for easy access to attractions in the popular Vaal region. Our lovely establishment consists of all the needed facilities and room amenities you will require when looking for Meyerton accommodation establishments. 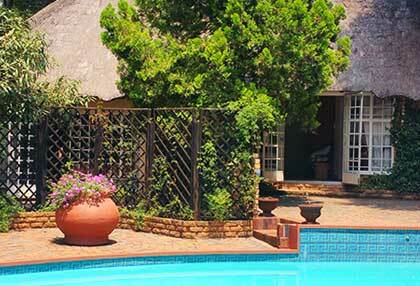 The Village Guest House’s sparkling swimming pool is located centrally for the guests to use. We also have internet facilities available, which is an important aspect if you are travelling for business purposes. Our braai facilities are open to all guests; a portable gas braai makes it convenient for all guests to use, just arrange with our friendly staff for assistance. In addition to our accommodation units, we also provide a shuttle service for our guests who require transportation – prior to arrangement. Another amenity of our establishment is air conditioning – installed in every room, as well as the dining room in the main house – perfect for those extreme weather conditions. 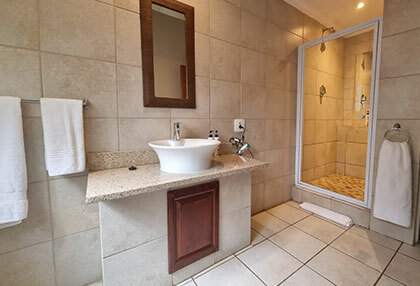 The Village Guest House also offers a laundry service to our guests, and we make use of Aranza Travel & Tours in Meyerton who will arrange any activities or tours you would like to take part in, around the Vaal Triangle region. Browse their website to see what fun activities they can offer you during your stay. 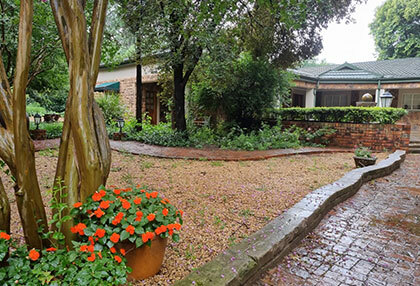 Our guest house is the perfect choice for your Meyerton accommodation, and will satisfy all your requirements. 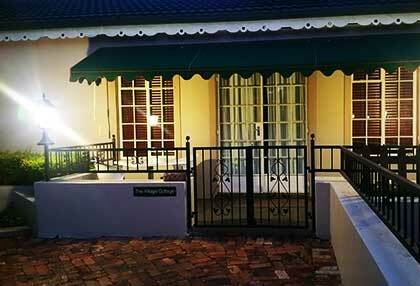 In addition to our luxurious accommodation, our guests love the alfresco dining atmosphere at The Village Guests House. Our breakfast served outdoors is very popular, including items such as freshly baked muffins, scones and home-made jams that you can enjoy whilst we prepare your delicious meal. Our garden is blessed with nature’s best, featuring fresh herbs and vegetables grown for in-house use. You are also welcome to enjoy your meal indoors, should you prefer. Dinner and light lunches can be served prior to arrangement, making the village Guest House a well-rounded accommodation establishment. 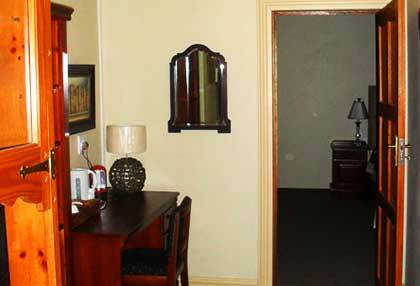 If you are in need of Meyerton accommodation, contact The Village Guest House today to enquire or make a booking! Book our bed and breakfast accommodation near Meyerton and be treated to a breakfast that is out of this world. Enjoy your breakfast outdoors al fresco style in our beautiful garden, or indoors in the dining room if you prefer. You can expect everything from bacon and eggs to freshly baked muffins and scones and home-made preserves and jams. We will see to it that your tummy is full and happy before you go about your daily activities. In addition to breakfast, we also offer 2 and 3 course dinners as well as light lunches, prior to arrangement. We can also advise you on other dining options and restaurants in the area and surrounds of Henley on Klip. We also provide packed lunches for our working guests on request, making us an excellent choice of Meyerton accommodation establishments! 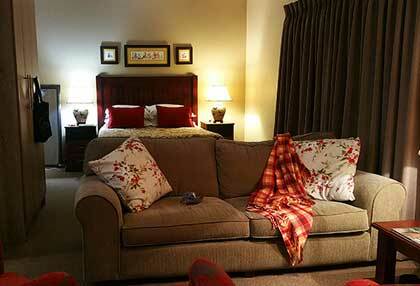 If you are I need of bed and breakfast accommodation near Meyerton, contact The Village Guest House today! 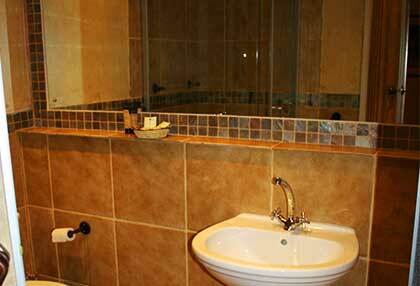 If you are looking for self-catering accommodation in Meyerton, The Village Guest House is the place for you! We offer luxurious self-catering rooms, featuring a fully equipped kitchen for you to prepare your own meals in. 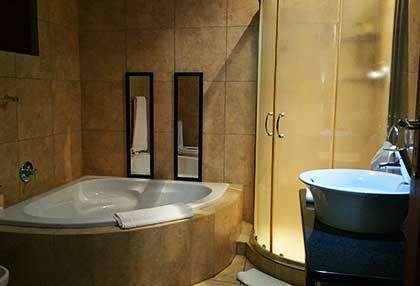 Self-catering rooms are a great choice when going on business trips and staying longer periods at a time. 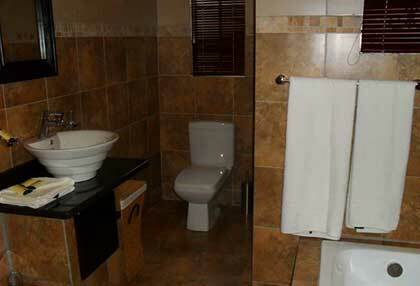 This room-only option is very cost effective, and a popular choice amongst business travellers. 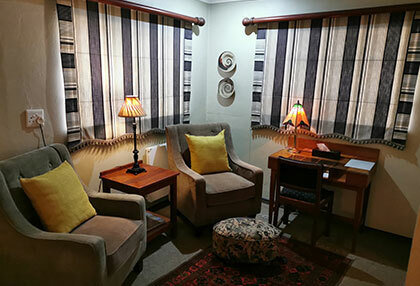 When staying in self-catering Meyerton accommodation at The Village Guest House, you will still be treated like royalty by our professional staff. Our guest house boasts a number of facilities that you can enjoy, as well as top class services such as laundry and internet access. If you are in need of affordable self-catering accommodation near Meyerton, contact The Village Guest House today! Enjoy a comfortable and luxurious stay when choosing The Village Guest House as your overnight accommodation near Meyerton. 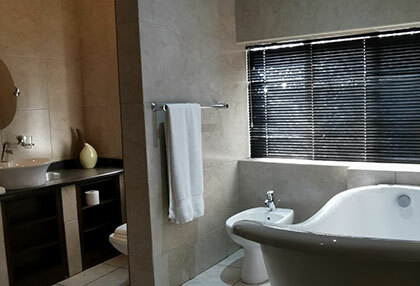 You can make use of our facilities during your stay, which includes a swimming pool, internet access, braai facilities and more – all you can expect from a reputable four star accommodation facility. 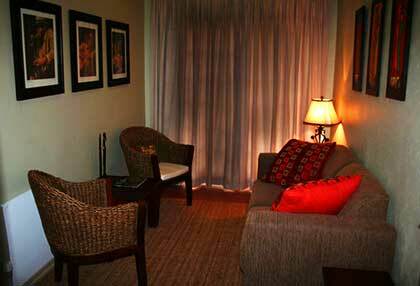 You can still stay in a comfortable and fully furnished room, even if you are only staying overnight. 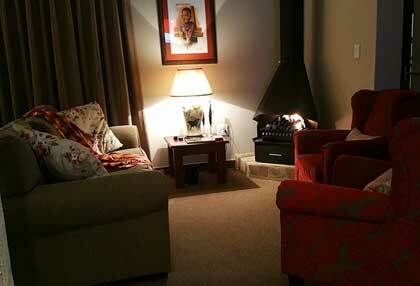 Our luxurious overnight accommodation near Meyerton is also very affordable, and will fit your accommodation budget. View our different rooms and accommodation prices on our website. 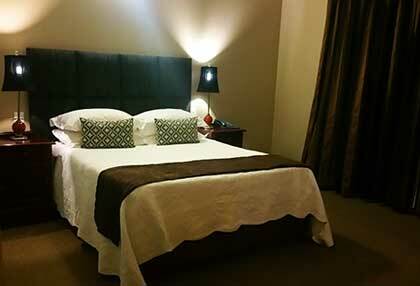 Contact The Village Guest House for more information or to make your accommodation booking! The Klip River is a Vaal Triangle landmark, which runs through towns including Vereeniging, Henley on Klip and Meyerton. This river is the main river draining the portion of Johannesburg south of the Witwatersrand, emptying into the Vaal River. It is a popular fishing spot for locals and visitors to the area. If you are looking for accommodation near the Klip River in Vereeniging, Meyerton or Henley on Klip, contact The Village Guest House today. 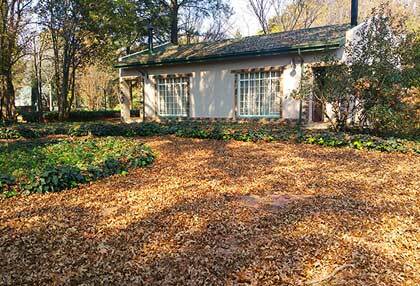 The Village Guest House is in close proximity to the Klip River, located in a natural and beautiful area. 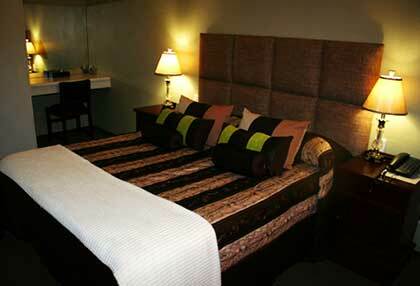 The Village Guest House is easily accessible for guests from the Vaal Triangle and surrounding locations. Book your Klip River accommodation at The Village Guest House today!